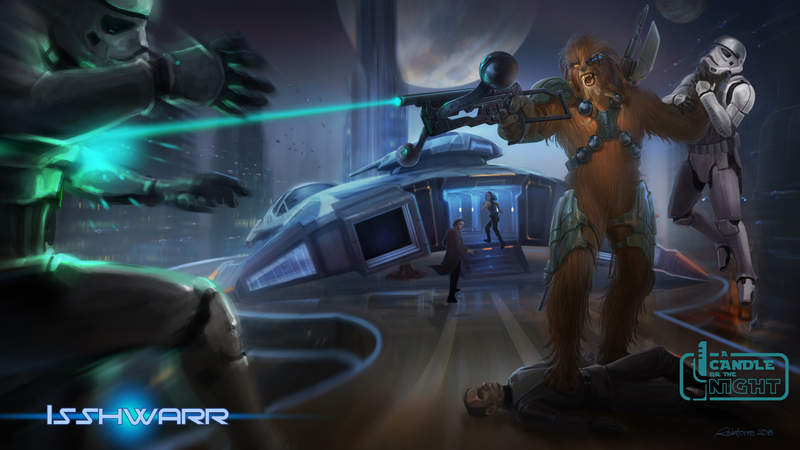 Isshwarr, like most Wookiee, was born on the planet of Kashyyyk. He was born in the Wookiee city of Kachirho. It was here he grew up in the great Wookiee coastal city and received a traditional education learning the common skills of mathematics, language, science, and crafting weapons and tools of natural materials for his impending venture into the Shadowlands in accordance with Hrrtayyk (wookiee right of passage). At the age of thirteen, Isshwarr went on Hrrtayyk and proved his rise to adulthood. He survived for two weeks in the Shadowlands which culminated in him being attacked by a Katarn which he was able to defeat. It was here he first sensed the force, which he sensed the Kataran ambush before it attacked. Under attack and at a disadvantage and in great distress he was able to inch his hand crafted spear to his reach which he used to over power and kill his attacker. His connection to the force was not very strong, distant at best. Even later in life, untrained he has only a minor connection to the force though his ability to move things has improved. He lived a normal life among his people and found his mate Kallabev. Some years later, the Clone wars started and the Wookiees were fiercely loyal to the Republic. He and many other Wookies fought along side the Jedi and Clones in several battles. It was when the Separatists invaded Kashyyyk that he saw the most action when they attempted to invade Kachirho. With the help of the clones they were able to repel the droid armies. However it was shortly after this battle that order 66 was broadcast and the end of the clone wars came. The new Empire betrayed the Wookiees, at the behest of the Trandoshans, and set about enslaving the entire planet to utilize them as labor and exploit the planet’s resources. Though there was uprisings, they were put down rather brutally. It was among this time he learned of the death of his mate Kallabev during this turbulent time and how he came to despise and hate the Empire so much, who he blames for the death of his wife in one of their work camps.Isshwarr himself was shipped off of Kashyyyk to be sent to work on some Imperial work project (it was in fact to be the Death Star). En route to this place, the Wookiee prisoners were able to kill their captors and take over the ship which they used to escape. It was here the next stage of his life began, the life of an escaped slave who used his past battle experience, hunting ability, and the reputation of Wookiees to become a gun for hire. He often took jobs among the outer rim making a modest sum as a bodyguard for wealthy outer rim travelers, part time bounty hunting, and the occasional underworld job that would hurt the empire or free any other Wookiees.